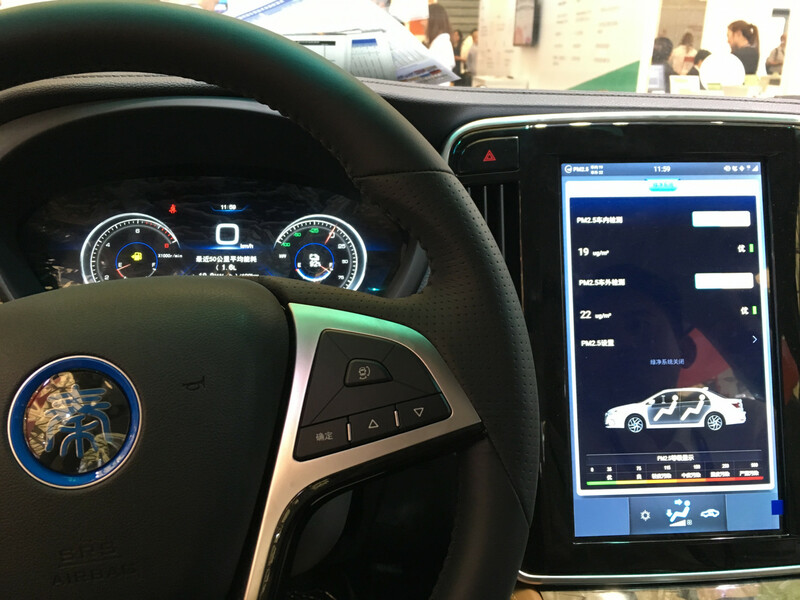 Volkswagen, Toyota, Alibaba YunOS and BYD displayed their connected cars at the World Mobile Conference Shanghai on June 28, 2017, showing the audience how their cars can integrate with our smarter world. The global connected car market is expected to garner $141 billion by 2020. Senior Vice President of Alibaba Cloud, Hu Xiaoming, said they expect to put 700,000 connected cars powered by YunOS on China’s streets in 2017. 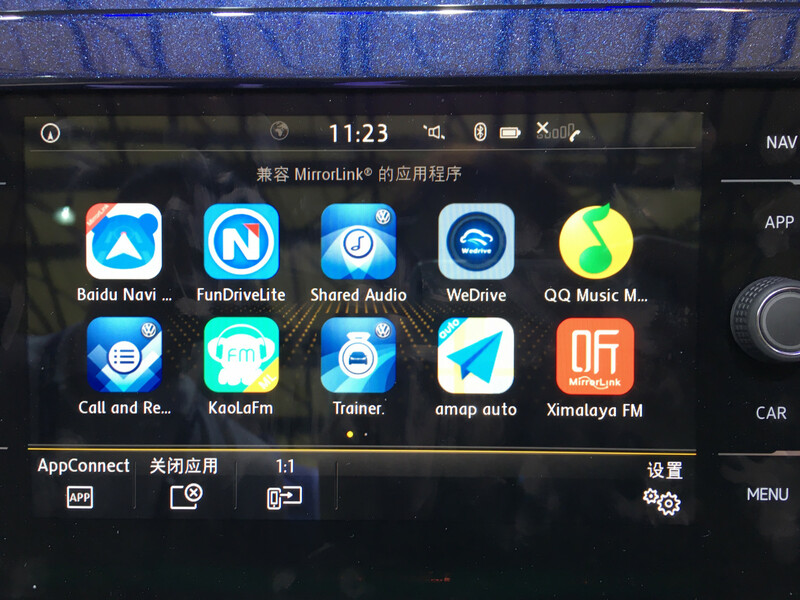 Comparing the apps that Volkswagen, Toyota, Alibaba YunOS and BYD are using for their connected cars revealed that all companies except for Alibaba YunOS had Ximalya FM integrated. Volkswagen and Toyota were using QQMusic, while Alibaba YunOS, of course, had an array of apps from Alibaba’s ecosystem – Alipay, Xiami, AliTravel, and Taobao. “The key functions or applications that should be in the car include navigation and FM radio. The AMap (高德地图) and Ximalaya FM (喜马拉雅) applications are currently embedded in third-party cars. We use them because they are the most popular app in each category,” Loic Lee, senior product planning manager at Huawei told TechNode at Volkswagen’s booth. So are these apps really the most popular app in their category? According to 2016 China App Rankings released by Cheetah Lab, the answer is yes. Ximalaya FM ranked first among China’s audio content apps with three times higher active penetration rate than No. 2 on the list. QQ Music ranked second on the music app ranking, following Kugou; both apps are owned by Tencent. In the navigation category, Amap ranked second, following Baidu Maps. Amap, however, has a higher number of weekly app openings. 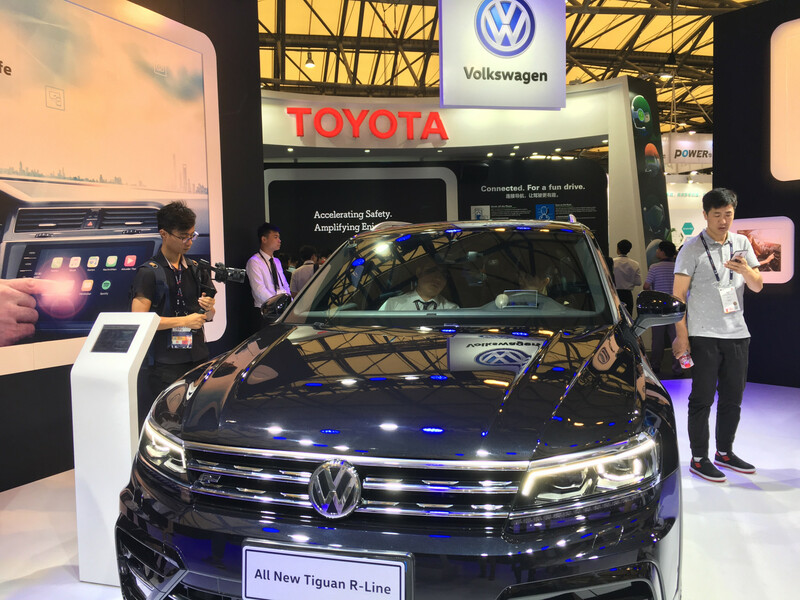 Volkswagen’s newest SUV Tiguan R-line can connect with Huawei P10, iPhone, and Samsung phones. For example, an owner of Huawei P10 can connect to the car’s cloud via a USB cable. The car’s head unit display and the phone keep the same interface and experience. To control the car remotely from their phone and to call someone from the car’s head unit, users need to have a SIM card in the phone. German car maker Volkswagen’s connected cars work with several device interoperability standards that offer integration between a smartphone and a car’s infotainment system, including Baidu Carlife, Apple Carplay, Android Auto and Mirror Link. In China, Volkswagen supports connection with Huawei’s P10, P10 Puls, Huawei Mate 9, and Mate 9 Pro. “Samsung also supports Mirror link, but Huawei, as a Chinese company, has the power to ask third-party apps to work with them. 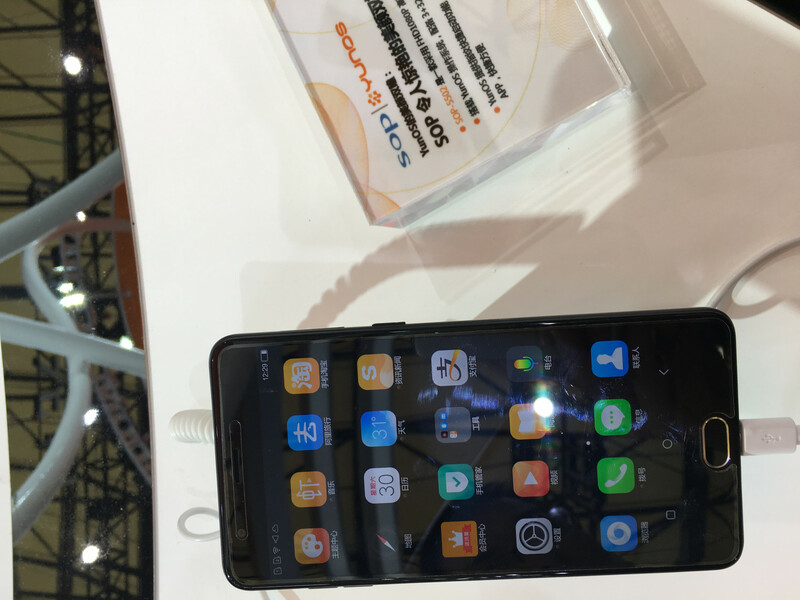 That way, we can provide more applications,” Loic Lee, senior product planning manager at Huawei told TechNode. Originally created by Ford, SmartDeviceLink is an open source platform that connects smart devices with a car’s on-board system. 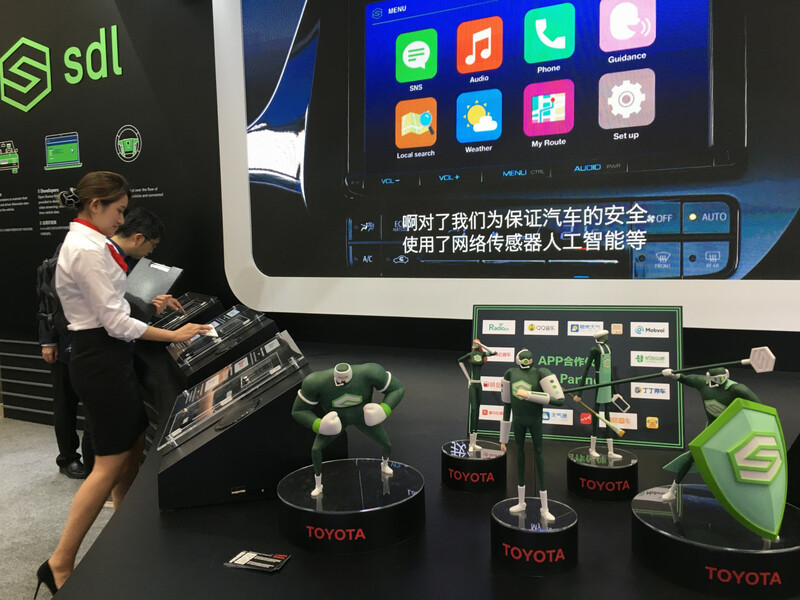 Toyota has included five apps that come with the car, including QQMusic, Ximalaya FM, Zuimei Tianqi (最美天气 literally, “the most beautiful weather” in English), Japan Travel Information app made by KDDI, and a four-dimensional navigation app. 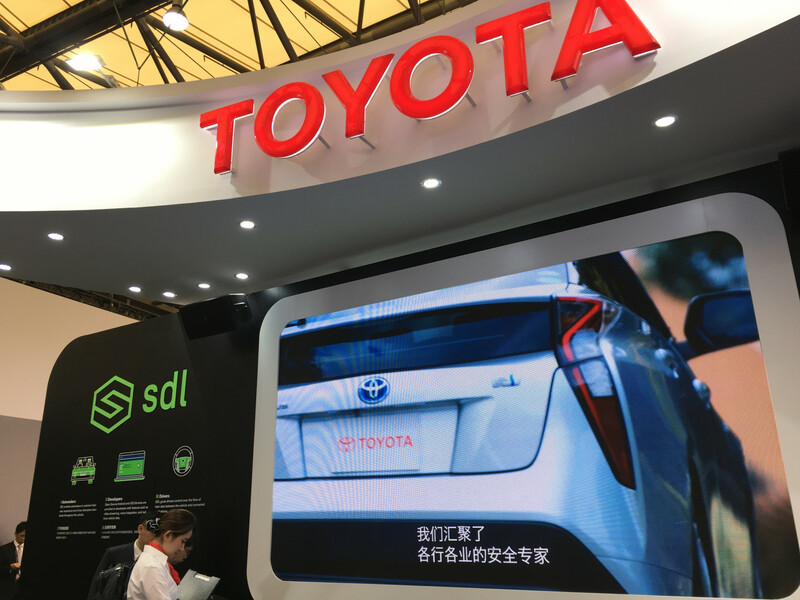 Toyota says it plans to launch SDL-powered connected cars in 2018. Toyota and Ford launched the SmartDeviceLink Consortium earlier this year to help car manufacturers and app developers create integrated driving experiences. Members of the SDL Consortium also include Subaru, Mazda, and Suzuki. 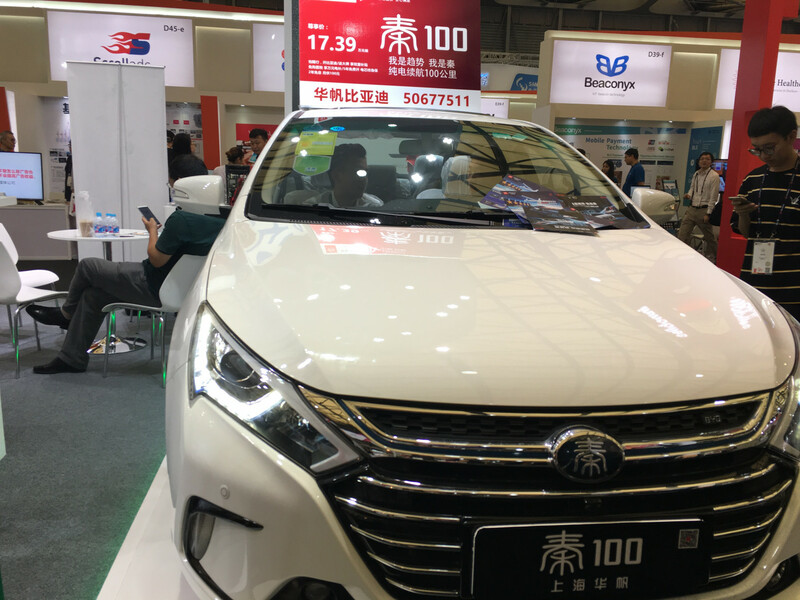 BYD’s Qin (秦, referring to Qin Shihuang, China’s first emperor) comes preloaded with BYD’s own app stores, supporting connection with any Android or Apple phone. The Qin also comes with features made specially for the Chinese market: a Dual Mode that allows drivers to switch between full-electric and hybrid as well as an air filtration mechanism. “BYD’s Qin model has an app that monitors the PM 2.5 levels inside and outside the car. When PM 2.5 reaches a certain level, the car can purify the air in 5 minutes,” said a BYD staff member at the exhibition. On March 2017, Alibaba Group’s YunOS released YunOS Carware intelligent vehicle operating system. The software supports applications for the car itself as well as a HUD (head-up display), driving camera, and an intelligent rearview mirror. Cloud-based data services enable YunOS Carware to anticipate user needs and recommend appropriate music, radio programs, or car services. On top of that, YunOS Auto’s engine is able to process and analyze data about how people drive. Since August last year, the connected car gathered 11.7 billion data points on driving behavior. The data will be used to encourage drivers to change their driving habits, saving fuel and making cities smarter. Currently, 23 mobile phones are using the YunOS cloud system, including DOOV, SOP, China Mobile, Xiaolajiao (小辣椒) and Meizu. In July 2016, Alibaba’s joint SAIC officially launched the mass-produced connected car Roewe RX5. 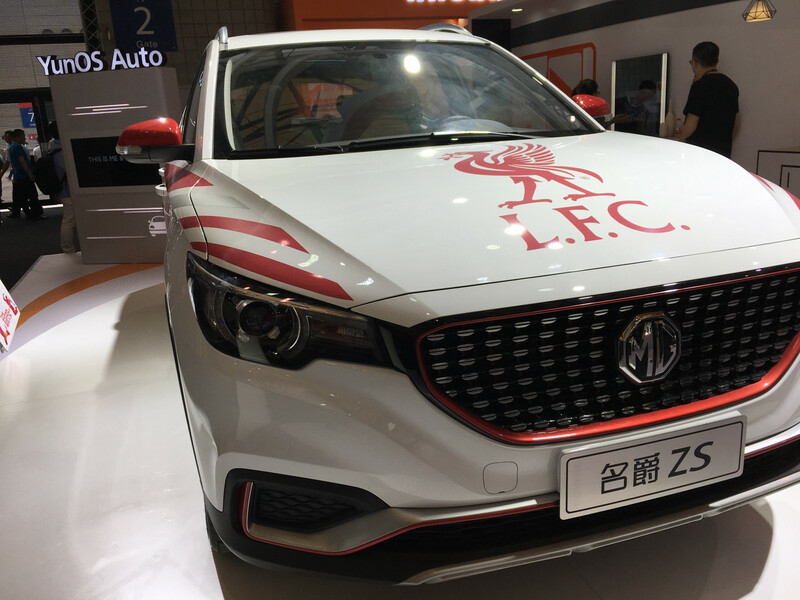 Chinese automaker SAIC (上汽) has several connected cars in the market with YunOS Auto integrated, including Roewe RX5 (荣威RX5), Roewe eRX5, Roewe ERX5 pure electric version, Roewe i6, Roewe ei6, 名爵ZS, andChase D90 (大通D90). The top selling model is Roewe RX5’s with orders exceeding 100,000 in March and average monthly sales of over 20,000.